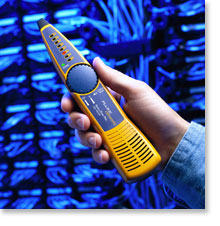 CableIQ qualification tester is the first cabling bandwidth tester for network technicians. This network cable tester It gives even the most novice tech the vision to see what speeds existing cabling can support, quickly isolate cabling from network problems, and discover what is at the far end of any cable. That means network techs can close trouble tickets faster, reduce on-call time, and save money by better utilizing their existing infrastructure. This requires both the CableIQ Reporter Software 2.0 and the CableIQ Firmware 1.80 to complete the update. The details on how to perform the update and the files can be found here on Fluke Networks Website. CableIQ qualification tester's powerful troubleshooting capability and intuitive interface enable your frontline technicians to identify and troubleshoot a wider range of problems within your infrastructure. Is the port active? Are the duplex settings matched? Is it a network problem or a cable problem? Can the cable support the required network bandwidth? CableIQ network cable tester is the only tool that can answer all these questions before trouble tickets are escalated to the next level reducing problem escalation by up to 30%. When you deploy Voice over IP (VoIP) or Gigabit Ethernet, you want to make sure that the existing cabling will support the bandwidth requirements of your new equipment. Your cabling was certified, but moves adds and changes have rendered many links incapable of running desired speeds. CableIQ quickly reveals whether a link, including patch cords, is qualified for voice, 10/100BASE-T, VoIP, or Gig. Knowing your cabling's bandwidth capabilities before upgrading can prevent countless hours of future downtime and labor hours wasted on unnecessary troubleshooting. See what speeds your existing cabling can support. CableIQ's four-second Autotest clearly indicates with a check mark which speeds and applications the tested cable can run. Plug into any cable, patch panel, or wall jack and see both the cable details (length/wiremap) and far-end device details (speed/duplex settings) at once. 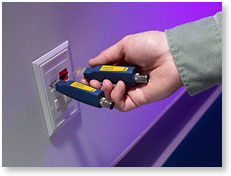 A series of both cable and network test functions help you isolate connectivity problems. For instance, if Discover mode shows duplex settings are matched but the problem persists, run Autotest to see if the cabling can support the required bandwidth. If a link is not qualified, CableIQ provides detailed information on the nature and location of cabling performance faults such as crosstalk or large impedance changes. With CableIQ your techs can close trouble tickets faster by cutting cable troubleshooting time in half. Troubleshoot cabling faults in half the time. This screen shot represents a cabling link that did not qualify for 1000BASE-T because of a connection fault at 4.1 metres. CableIQ's Discover mode shows you exactly what's at the far end of any cable. At the switch, test each cable one at a time. You can quickly see whether the cable is open at the far end, or is connected to a PC. Or use CableIQ's hub blink feature from the workstation to flash the corresponding switch port LED. You may be surprised at how many unused ports you can free up and redeploy using CableIQ. Determine where installed cables are routed, all from one location. Attach Remote ID's in different locations, then perform multiple cable tests from the distribution center or wiring closet. 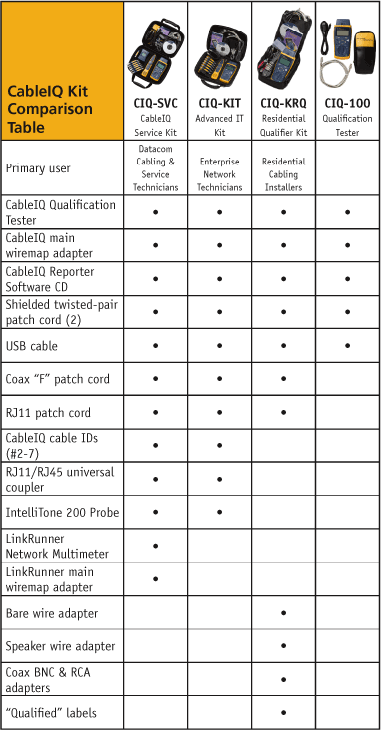 CableIQ provides the wiremap, pair lengths, distance to fault, and remote ID number of each tested cabling link. Intelligent wiremap tests for length, shorts, split pairs or opens and displays with an intuitive graphical interface where a fault is located. CableIQ's Intelligent Wiremap shows pin 6 open at far end of tested cable (130 ft/34 metres). Intuitive user interface and graphical display guides user with little or no training required. Remote adapter doubles as a protective endcap. To maximize the value of your CableIQ ownership, choose one of our specialized kits. Each kit is tailored for qualification testing in specific work environments shown below in a convenient comparison chart. 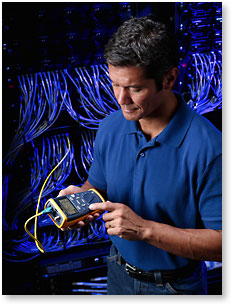 Qualification is a new category of testers designed to meet the emerging needs of network technicians who need to upgrade to higher network speeds as well as troubleshoot connectivity problems. 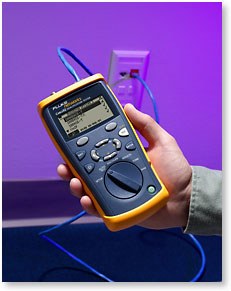 Qualification testers, like Fluke Networks new CableIQ Qualification Tester, determines if an existing cabling link can or can not support certain network speeds and technologies. This differs from certification testers, like the DTX CableAnalyzer, which guarantees cabling installations comply with TIA/ISO performance standards and basic verification testers, like the MicroScanner Pro, which tests if the cable is connected correctly. Qualification testers allow network technicians to perform a series of troubleshooting steps to better isolate cabling from network problems. For example, a first step in troubleshooting a network connectivity problem might be to check the speed and duplex settings of connected devices. If the tester shows the settings are matched, but the problem persists, a qualification test can be performed. Performing a qualification test will allow the technician to identify whether insufficient cabling bandwidth is the cause of the problem. Knowing your cabling's bandwidth capability allows you to close trouble tickets faster and helps ensure seamless upgrades to higher network speeds. When to use a qualification tester: If you are a network technician, and need to see whether the existing cabling will support your 1000BASE-T network, a qualification tool is the right choice. If you need to troubleshoot connectivity problems and isolate cabling problems from network problems, then qualification is the perfect solution. If you have an existing network and are doing small adds, moves, and changes, or are setting up a temporary network and just need to qualify it for a specific network technology, a qualification tool is a good option. When to use a certification tester: If you're a commercial installer or network owner who needs to prove that all cabling has been installed correctly, and meets TIA or ISO link specifications, you must certify it. If you are in a troubleshooting environment, and need to show unequivocally that the link under test is failing category 5e or 6 performance requirements according to TIA or ISO standards, your only choice is a certification tool. If you have a mixture of fibre and copper cabling, and often need to test both, cable certification tools do that best. To receive the support and financial security of a manufacturer's warranty, certification to TIA/ISO standards is your only option. Anything else makes the installer liable for the performance of the installation which can be quite costly. For example, a large 1000 link installation could represent a $100,000 (USD) project, which can be a hefty liability if manufacturer warranty is not obtained. When to use a verification tool: Verification tools are typically used by any technician who pulls and terminates cable or performs basic moves, adds and changes. These tools are used as a first line of defense in finding connection and wire-pairing faults.